The morning began with Bharat instructing everyone to carb-load – nobody was sure what to expect from rural Albania and when our next meal would be. Before heading into the Albanian Alps we decided to take a trip to see the 4km of “pristine” Albanian coastline. We’d seen some pictures of beautiful looking coves in Albania with crystal clear blue waters – this was not one of those. With dark brown sand and covered in rubbish we couldn’t bring ourselves to stay longer than 2 minutes. We will not be taking our next beach holiday there. Bharat, who has had his last cigarette a dozen times this trip, was later seen buying a fresh packet of slims from a roadside kiosk in rural Albania to calm him down. Who else thinks he should just admit he’s taken up smoking again? And Rachel was not out of the woods yet. After Bharat saying he was going “strap her in” and that she wasn’t allowed to move from the tuk tuk without his permission, Rachel ran to take another photograph and, as she did, got tangled up in brambles. Blood started appearing from the scratches and Bharat took a deep breath and lit another cigarette. 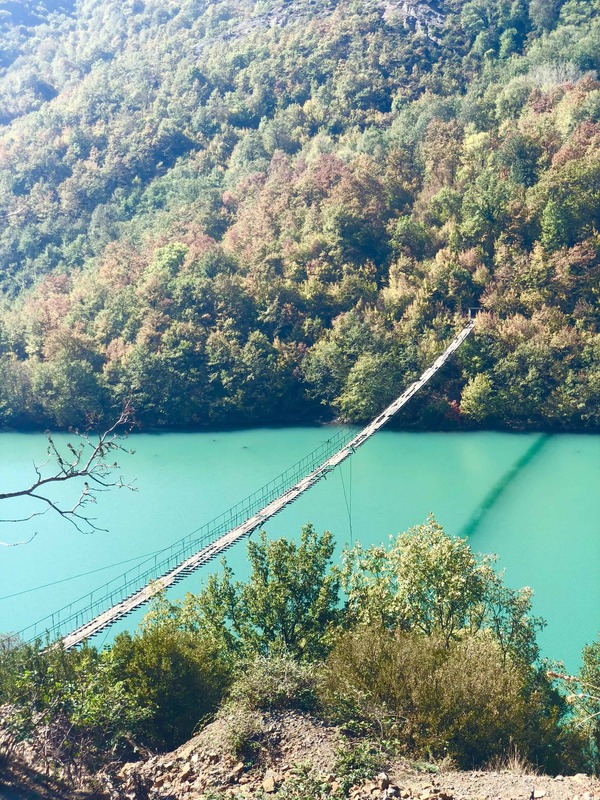 The Albanian Alps defied all our expectations – miles and miles of gorgeous hills, just starting to turn amber for the late autumn, and bright blue limestone rivers in the valleys below. There were even less barriers to stop us falling off the mountain passes than on the Kotor Serpentine and this combined with the many ‘Albaniacs’ overtaking on corners while texting meant Rachel felt sick for most of the journey. Amy and James had read a BBC article about how Albania is now the largest producer of outdoor-grown cannabis in Europe. The case study in the article referenced a village north of Tirana (where our route was travelling through) and so the two of them spent the ENTIRE journey looking for gangsters, guns and ganja. James claimed to see a stray plant on the side of the road, and there were an awful lot of blacked out Mercedes driving through rural Albania, and even more men just standing around at weird points along the route, but all in all they were fruitless in finding the Albanian cartels they’d been hoping for. You can tell Albania is the poorest country in Europe – driving through the towns in the rural North were genuinely like being back in Kenya. You can tell unemployment is high – everyone seems to be sitting in a café or on the side of the road watching people go by. But we love Albania for all of this – it’s so different to everywhere we’ve been and it’s made all the better by everyone whooping and cheering at Sumo! We had our pants pulled down at the Macedonian border. Figuratively, not literally. We needed to buy insurance for our 2 days in Macedonia and it ended up being 3 times more expensive than in Bosnia & Herzegovina, plus we had to pay for the taxi fare of the man who had come to arrange it. However, the border guards took a real shine to Sumo which meant the 50 minute wait flew by. We don’t often say this, but Bharat was right. We arrived at our accommodation in Macedonia (Hotel Tutto – thank you Nina and Jayesh!) at 5.30pm and hadn’t eaten since 7am that morning. Ravenous we wolfed down some delicious food prepared by the hotel, and it wasn’t just delicious because we were hungry. It turns out we’d accidentally stumbled across a gem and the ecologically-minded owner of the hotel, Tefik Tutto, is well regarded as a pioneer of Macedonian “slow food”. If possible everything is grown or foraged from near the hotel and then it is cooked using traditional Macedonian techniques to make some exquisite dishes – and all for less than 6 EUR each! It was early to bed, early to rise. After a yummy, seasonal breakfast and a photograph of Sumo with the owner we set off to Skopje. The first two hours were lovely (although extremely cold!) – working our way through the hills with the trees a thousand different shades of autumn. The next 6 hours were not. Everything changed when we stopped to take a drone picture of the tuk tuk crossing a dam. Rachel and Bharat were driving across it for the 3rdtime when Amy and James (from 400m away) could hear shouting. Amy rolled her eyes and muttered something about the parents being at it again, before quickly realising it was the two men marching very quickly towards to the tuktuk and jabbing in the direction of the drone. The protestors marched over to James and Amy holding the drone remote, desperately trying to land it, and started yelling at them in Macedonian. We’re not sure what they said but “police” and “big problem” were routine phrases and the angriest one of the two took our car number plate and stormed off – to do what we don’t know! Eventually we decided to simply get out of there, with the remaining man telling us that our fate rested with the decision of Mr Potbelly who had strutted back across the bridge. Amy and Bharat spent the next hour convinced we were being tailed by the Macedonian secret police (i.e. a rugged man in a battered 2 door Peugeot). We are waiting to get to the Macedonia-Bulgaria border to see if we are on Macedonia’s “most wanted” list. We have a video of the debacle unfolding – can anyone translate our opponents’ whispers we can send it to you! We desperately want to know what they were saying! Mr PotBelly and his sidekick are not pleased! The remaining drive was along the Mother Teresa motorway (grey hairs for Amy, nil points for Bharat! ), which was a misleading name given how incredibly uncharitable it is to have 5 toll stations along one 50km stretch of road! However, in no time we arrived at our accommodation in Skopje (with thanks to PwC Macedonia) and for our interview with Macedonian TV Kanal 5! In our previous experiences with the press we have made sure to schedule rehearsals for Bharat to minimise his TV bloopers. We thought this level of preparation and training would pull us through this interview unscathed, but when asked about who was going on the trip Bharat simply said “four” and swiftly moved on to talk, at length, about the tuk tuk and the Fiat rather than introducing who we all were like any normal person would have done… When asked about the ups and downs of the trip he talked about the phantom puncture we’ve had…rather than relaying any of the true stories such as ditch-gate (perhaps he’s erased that from his memory to avoid a PTSD diagnosis). Although he wasn’t alone – James absolutely stuffed detailing our website address – very amateur from him. However, the TV team seemed pleased, particularly with their ride in the tuk tuk and we can’t wait to see what it looks like on Macedonian TV on Monday (tune in to Kanal 5 – Backstage Show for the piece!). The interview meant we toured Skopje by night. If there was one word to describe the city it is “statues”. So many humungous statues of men, horses, lions – you name it, there’s a statue of it. The buildings, a lot of which have been recently restored, or rebuilt, were nicely lit and made the old centre look magnificent at night. Although Amy was particularly impressed as she thought Skopje was a Macedonian version of Cheltenham, rather than the capital. Another nod to her worthwhile Geography degree. Day 34 – Rachel for being accident prone and leaving the tuk tuk on multiple occasions without Bharat’s permission. But also Bharat, for getting swindled at a petrol station, and paying €5 for only a thimbleful of petrol. It was also hilarious watching the petrol attendant shouting at Bharat that the tuktuk needed “Benzina” without Bharat knowing that it was another name for petrol. Day 35– Amy claimed that the tuk tuk was losing power in 4thgear when she was driving along flat roads. Bharat conducted the same procedure we used before to get the tuk tuk working (see previous blogs) and let out some of the petrol onto the road, only to realise Amy had been driving for over an hour with the handbrake on! Day 34 – Seeing a woman sitting in the middle of a field shepherding her rafter of turkeys! Day 35 – Bharat’s budding romance with the slow cooking movement in Macedonia grew and grew as he spent the morning speaking to the owner of Hotel Tutto. The owner was very engaging and clearly enjoyed Bharat’s high praise, as when Bharat checked out the room the owner gave him 2 bottles of wine and a goodybag of pickles and jams from the hotel’s garden! The owner was less impressed when Bharat tried to offer him some of the stale biscuits we had in the back of the tuk tuk. You live and you learn. Day 35: Amy and Rachel coming across the first “long drop” of the trip and not being sure which way round to face! Number of half built empty buildings in Albania: more than finished occupied ones! See photos below. Favourite Albanian pastime: pressure washing all those Mercedes! Albanian maize stacks are EVERYWHERE! A rickety bridge we decided against! The glamorous office of the tuk tuk team – working on the blog in a petrol station in Macedonia! Macedonian breakfast drink of wild cherries steeped in something!